Defined by altitude, Orange is one of Australia's highest and coolest regions. A capricious grape to grow, Merlot demands a regime of perfect conditions to achieve an even berry set. The growers of Orange have dutifully obliged over many years, painstakingly developing this new but salubrious winegrowing precinct for the realization of world class Merlot. Fruit sets very well and bunch thinning is undertaken to limit the yields. Cumulus will handsomely accompany roasted Mediterranean vegetables with lamb and wild mushroom medley. 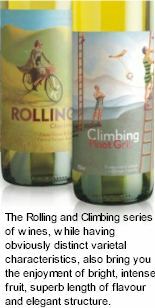 Climbing Merlot is an active reference to the high altitude vineyards whence fruit is sourced. It also defines the Cumulus team's ongoing quest for higher achievement. Parcels of Merlot are harvested and crushed, destemmed and cold soaked for a fortnight. Ferments begin at cooler temperatures and are treated to gentle pumpovers as they peak at 28°C. Time spent on skins is managed for optimal tannin extraction, pumpovers are gradually decreased to wetting the cap once daily. Upon completion, batches are treated to an extended soak, pressed off skins into a selection of French oak barriques for a year's maturation, before assembling, fining and filtration into the finished wine. Medium red colour. Lifted and bright, fragrant with sweet plums, leafiness, hints of dark chocolate and subtle oak tones. A mouthful of ripe dark plums, black cherry and a hint of herbs layer beautifully in a medium bodied, elegantly structured wine. The smooth as silk palate finishes with spiced, earthy notes and dark chocolate.